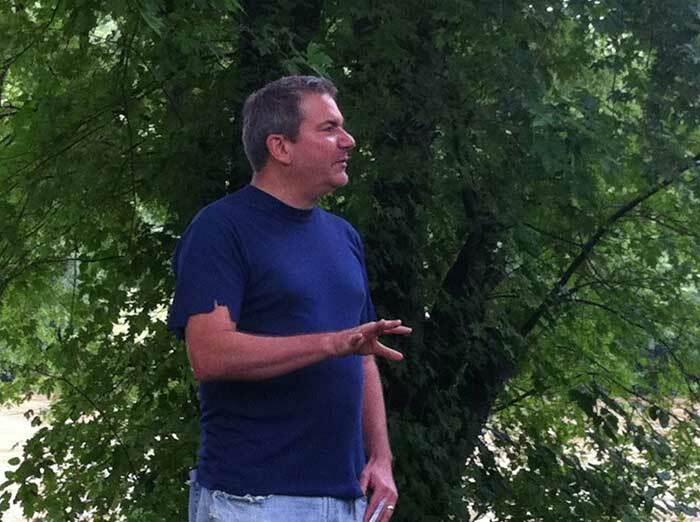 Curt Cloninger gives a brief lecture on the banks of the French Broad River in Asheville, North Carolina, about psychogeography, the Situationist practice of dérive, and Henri Bergson's understanding of time, memory, matter, and the mind. After Cloninger instructs participants in the finer points of subjectively drifting through time in order to reclaim it, participants drift downriver in floating tubes. The last person to reach the destination (The Bywater Bar) is crowned the winner. 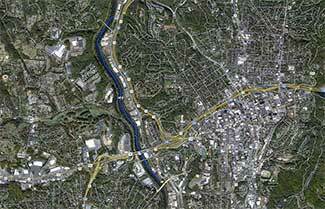 explain DEBORD's derive (drift through city via attraction/repulsion). a metaphorical drift. river sets tires and humans horizontal. what was moving you forward is now spinning you round. the river has most of the locutionary agency now. BERGSON on matter/memory >> memory not stored any "where." we have total recall. present tense matter acts as a filter. the cone. (the kitten experiment >> bodies in space give meaning to vision). Dreaming: everything comes up and connects, because there is no matter filter. actualizing the virtual. WHITEHEAD's process of ingression. 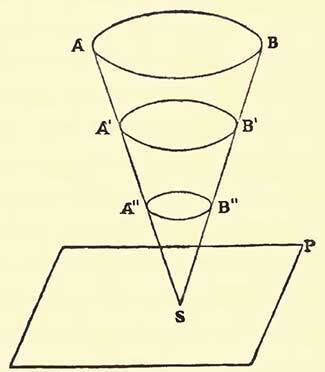 an egyptian pyramid as a particularly long and related series of micro-events (bergson would say a single enduring event) rather than a discrete object. everything (and humans) constantly becoming. What agency do we have to navigate/drift through memories? PROUST suggests not a lot. The sound of a spoon on a plate throws him backwards in time, the taste of a madeleine cake. involuntary experiences. So maybe this drift is just a futile experiment. 2) Don't be bothered by the mix of man-made/natural. try to enjoy it for what it is -- our world, right now. 3) don't wear a watch, don't worry about winning/losing. 4) enjoy time with friends, but let yourself go solo for at least a while. 5) be attentive to your own memories. don't strain (drifting is not forcing), but maybe something will arise, having been primed but unbidden. announce about bridge landmarks and Bywater Bar sign. Bywater is closed. beer at Wedge. 4) any past memories, thoughts, critiques, or anything else they want to share.